Harvard Business Review research finds companies with a more mature use of cloud are significantly more likely to have launched new products and expanded into new marketing than less mature companies. In this global survey of 376 business and technology companies, Harvard Business Review found a shift from pockets of cloud at the edges to the permeation of cloud throughout the enterprise. The report finds a correlation between an organization’s cloud maturity and the health of its growth initiatives. 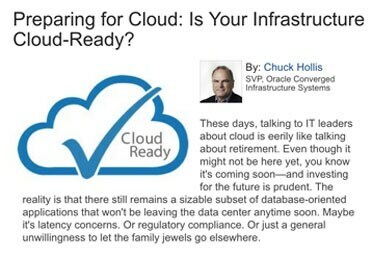 Oracle engineered systems take infrastructure optimization to the next level. They’re architected, integrated, tested, and optimized to work together. What’s more, they’re coengineered with Oracle software for a level of cloud-ready integration and Oracle Database performance that generic systems cannot match. Take a clear path to cloud. All Oracle engineered systems consumption models are cloud-ready when you are. Choose traditional on-premises deployment, private cloud, or public cloud behind your firewall—and get the same set of world-class, fully compatible, cloud-ready capabilities. Deliver optimum levels of performance, availability, and security. Build on Oracle engineered systems and do it faster, simpler, and cheaper than with generic systems. Cut costs from day one. Control software licensing costs by using fewer database cores to get more work done. Deploying a single-vendor model means you’ll spend less time on IT operations from day one, and more time creating new value for your organization. You can deploy Oracle engineered systems with confidence, knowing that the world’s largest organizations trust Oracle to optimize and protect their most critical databases and applications. And, as your operational requirements change, Oracle engineered systems can easily integrate cloud capabilities when you need them. Oracle Exadata and Oracle Exalogic are the perfect combination. 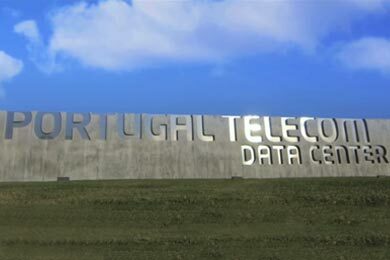 Engineered systems help drive Portugal Telecom’s cloud transformation by providing deployment and management simplification and better customer connectivity to help lower costs and improve satisfaction. 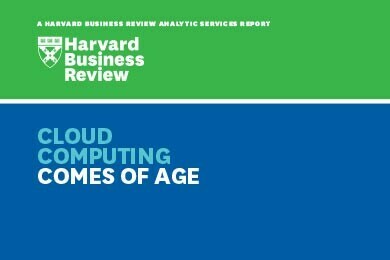 Harvard Business Review research finds companies with a more mature use of cloud are significantly more likely to have launched new products and expanded into new markets than less mature companies. Oracle’s cloud-ready infrastructure is optimized for today and ready for tomorrow’s move to the cloud. Think of it as cloud insurance. 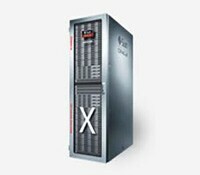 Exadata Database Machine is the highest performing, most available architecture for Oracle Database. You get extreme performance, rapid time to value, straightforward deployment, and a system that's ready for the cloud when you are. Big data is key to understanding customers, enhancing profitability, and keeping pace in a competitive marketplace. But is your current approach to analytics holding your business back? With Big Data Appliance, you get a unique, cloud-ready, big-data platform capable of delivering the smart data insights and rapid time to value you need. Database Appliance is the lowest-cost entry into Oracle Engineered Systems, ensuring substantial savings in licensing without comprising performance. It’s engineered, built, and optimized to work exclusively with Oracle Database for unmatched simplicity and affordability. Exalogic Elastic Cloud is a datacenter building block that integrates compute, networking, and storage hardware with virtualization, operating system, and management software. It delivers low total cost of ownership, reduced risk, higher user productivity, and one-stop support. An excellent choice for remote offices, small offices, and DevOps environments, MiniCluster S7-2 is a simple and efficient engineered system designed to run enterprise databases and applications with uncompromising security. Whether you are running Linux, Microsoft Windows, or Oracle Solaris applications, Private Cloud Appliance supports consolidation for a wide range of mixed workloads in medium-to-large data centers. It’s a converged infrastructure system delivering private cloud at an industry-leading price. Combining revolutionary Oracle Database efficiency and performance with near-zero-overhead, secure multitenancy, and private-cloud management tools, SuperCluster M8 is a complete, scalable, and secure cloud infrastructure for database and applications. Zero Data Loss Recovery Appliance is a ground-breaking data protection solution that eliminates data loss exposure and dramatically reduces data protection overhead on production servers. Totally scalable, it can ensure end-to-end data validation and implement full lifecycle protection, including disk backup, tape backup, and remote replication.